On Monday, Philippe, Charlotte, and I went to meet Dr. King. Not the one we’ve been celebrating all week, of course. Not even his cousin, I don’t think. Dr. King the orthopedist. Because it floored me, I have to start with the least important information: Charlotte clocked in at 4’7″. I think this is at least an inch taller than her annual check up last month. On the scoliosis front: Charlotte was examined by Dr. JP Manolo, a resident. He was thorough, kind, and smart. He took notes, told us what he found and what he was looking for. He explained the different kinds of scoliosis (infant, youth, adult). His conversational tone put us at ease and he observed Charlotte as he spoke. While he was clearly going to examine her, I think he had decided on first glance that he wasn’t looking at anything frightening. So he set about setting us at ease. Then he examined Charlotte. First, he had her touch her toes. Charlotte has had tight hamstrings forever, so this part of the exam is hard for her–simply touching her toes without bending her knees is a challenge. He measured the curvature in her spine with a device that looked like a level with a half moon cut out of it. And he found a 7% curvature. Then he sent Charlotte for an x-ray. Dr. King came in with Dr. Manolo to explain the findings: Charlotte has a 15% curvature in her spine. This is, he said, “just a number.” 0-10% is “not diagnostic.” 10-30% is considered mild, 30-45% is moderate and >45% is serious, requiring surgery. He noted that +45% is rarely seen in children who don’t have serious underlying medical issues. Charlotte’s curvature may be related to the truncus arterious and thus be “embryological” or it could be related to the cracking open of her ribs for repair. till related to the TA, but more a result of a surgical interruption in regular growth. 15% requires observation. We’ll go back in about 6 months. At that point, the 15% becomes a baseline and Dr. King will determine if the curvature is progressing or holding steady. He noted that more than 30% would require a brace, but that the doctors understand the repercussions of bracing an adolescent (Deenie, anyone?) and they try to avoid it. At this point, there is nothing to do. No exercises can prevent or stem the curvature. I think our relief was palpable. I’m quite surprised we didn’t giggle. All in all, it was another wonderful Lurie Children’s Hospital experience, and not just because we got the answer we prayed for. Categories: Ann and Robert Lurie Children's Hospital of Chicago, heart surgery, regular kid, scoliosis, Truncus Arteriosus Type 1 | Tags: Ann and Robert H. Lurie Children's Hospital, Deenie, scoliosis | Permalink. Okay, my title may be a bit misleading. I’m not sure how much attention Charlotte is actually paying to this weekend’s coverage for the 50th anniversary of the March on Washington and Martin Luther King, Jr.’s “I have a dream” speech. But, if she were asked about it and what it meant, she’d know. Why? Because she had an extraordinary English teacher in first grade. 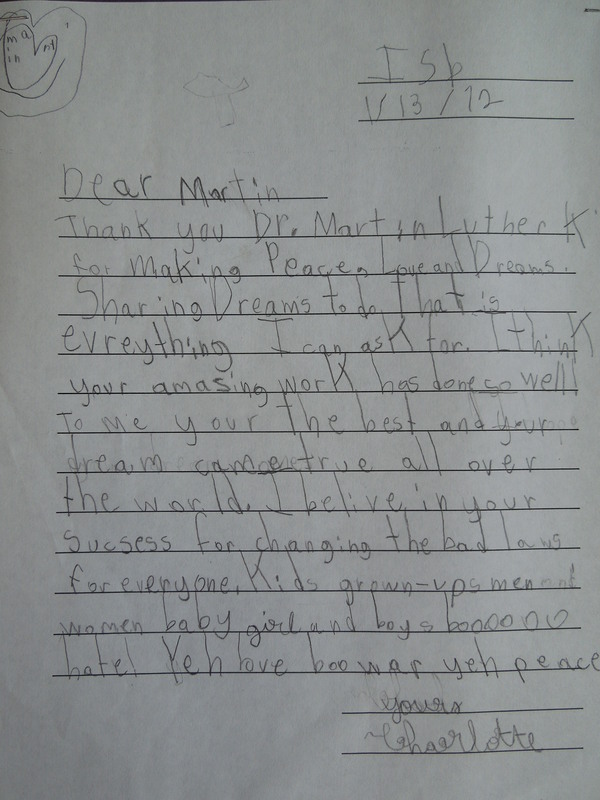 Thank you Dr. Martin Luther King for making Peace, Love and Dreams. Sharing Dreams to do that is everything I can ask for. I think your amasing [sic] work has done so well. To me your [sic] the best and your dream came true all over the world. I belive [sic] in your success for changing the bad laws for everyone. Kids, grown-ups men, women, baby girl and boys . Booooooooooo hate! Yeh love boo war yeh peace. I’m not saying her grammar was perfect. And certainly at 7 years old, she had some spelling to learn, but I was so proud of this letter. I only wish that her belief in the worldwide fulfillment of Dr. King’s dream were true. And I wish that her current belief, that if children were allowed to negotiate we’d have world peace in a jiffy, were true. I relish that she does not yet understand hate, and is not yet aware that in some countries there are children who are forced into waging war and killing others, or forced into prostitution. She knows, but doesn’t “get,” that there are kids who don’t have enough to eat, don’t get to go to school, and struggle in ways she’ll never understand. I hope her innocence and ideals last a bit longer. I fervently hope that together Charlotte, Philippe, and I might see Dr. King’s dream come true. And I hope that Charlotte’s newest goal, “to be responsible for world peace,” is one she can stick to! Rest in peace, Dr. King. Your dreams and words live on in our hearts. Categories: reading, regular kid | Tags: I Have A Dream: Writings And Speeches That Changed The World (Turtleback School & Library Binding Edition), March on Washington for Jobs and Freedom, Martin Luther King | Permalink. What is the Gold Coast Fashion Award Show, you ask? The Gold Coast Fashion Award Show is the signature fundraising event of the Children’s Service Board, an affiliated organization of Lurie Children’s Hospital. The 58th Annual Gold Coast Fashion Show is scheduled for Friday, September 27, 2013 at the Hilton Chicago. Last year’s show attracted more than 1,300 guests and raised over $400,000 in net proceeds in support of the Division of Pediatric Surgery at Lurie Children’s Hospital. The show includes individual store-sponsored segments from prestigious Chicago retailers and a competition segment where emerging designers compete for the coveted Gold Coast Fashion Show Award. Guests are treated to fashion through philanthropy as they view a fabulous display of elegant and high-end fashions in an array of categories from sportswear to evening wear. Charlotte had her 8 year old check up last week. It was no surprise that she had gotten taller (54.75 inches) and heavier (around 60 lbs.). But, there were surprises and it was all I could to do hold back tears in front of Charlotte. It seems like we’ve kind of glided from the STAR-band (2006) and second heart surgery (2007)through first grade, able to pretend that she’s just a regular kid. But, truth is, she’s not. She’s our special, quirky, bright, medically fragile kid. She is covered with physical scars and may bear more psychological scars than are apparent. Gilda Radner wrote that cancer gave her “membership to an elite club I’d rather not belong to.” Sometimes I feel like that as the parent of a medically fragile child. She is less fragile than many kids. The “fragile” refers not to her physical state as to the potential for medical upheavals in her life, I think. Most days, the club I belong to is the mother’s club. It’s not so elite. As my friend Kath has quipped, it is rather extraordinary that you need a license to drive, but anyone can be a parent, whether they enter the pact with forethought or not. Radner’s It’s Always Something (1989), the tale of her struggle as a strong, brave, funny woman to enjoy life despite a terminal cancer diagnosis is one of the best memoirs I’ve ever read. I remember buying the hardcover as a college student (who did that?!) and staying up all night to finish it. It is a book I refuse to cull from my shelves and imagine reading again. I will, as soon as I can get it out of its box. In the meantime, we’re living it, sort of. We are reminded that we belong to this club of parents with medically fragile kids. Kids whose early life diagnoses can rear their head somehow at any point, or seem to at least. Charlotte has a curvature in her lower spine which I have noticed for the past several months. 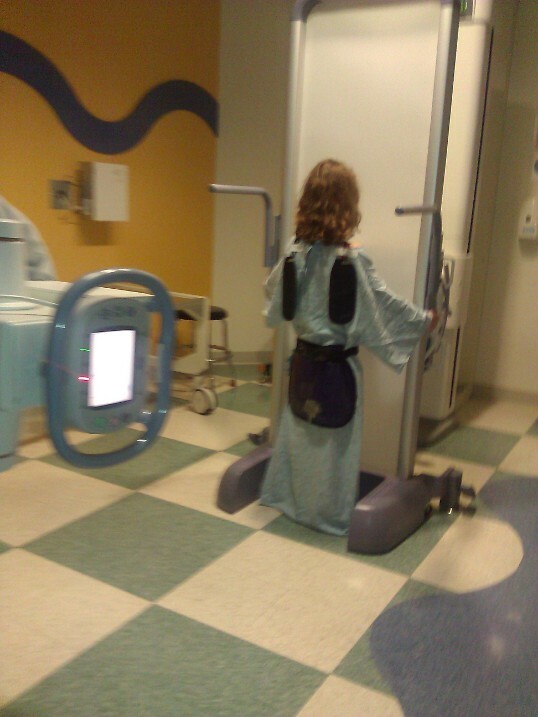 Scoliosis is, I know, common and can occur in the spines of kids who are not medically fragile. I get that. I also get that we’re no longer in the world of Judy Blume’s Deenie and that if it is scoliosis, it may not necessarily mean surgery or a back brace. But I can’t help thinking of that. You see, for me this is just more upon more. It’s one more doctor–Charlotte understood that immediately and wasn’t happy about that. Maybe one more regular therapy appointment–she understood that, too, and immediately began worrying about having OT, PT, Hebrew school, and piano. “Mommy,” she said, “when will I play? How can I do any other after school clubs?” I had to tell her take a deep breath and that we’d figure it out once we see the orthopedist. Now we wait for further diagnoses and follow up plans. And we try, in Ms. Radner’s honor and memory, to enjoy every minute as we wait. We know how lucky we are that Charlotte is as healthy as she is and that we are so lucky to have her with us. But I can’t help feeling like I want to bang my head on a wall or hide under a blanket for a week. Categories: CHD, development, Lakeview Pediatrics, Occupational therapy, Physical Therapy | Tags: It's Always Something | Permalink.